Named for a forgotten constellation, the Quadrantid Meteor Shower is an annual event for planet Earth's northern hemisphere skygazers It usually peaks briefly in the cold, early morning hours of January 4. The shower's radiant on the sky lies within the old, astronomically obsolete constellation Quadrans Muralis. That position is situated near the boundaries of the modern constellations Hercules, Bootes, and Draco. About 30 Quadrantid meteors can be counted in this skyscape composed of digital frames recorded in dark and moonless skies between 2:30am and local dawn. 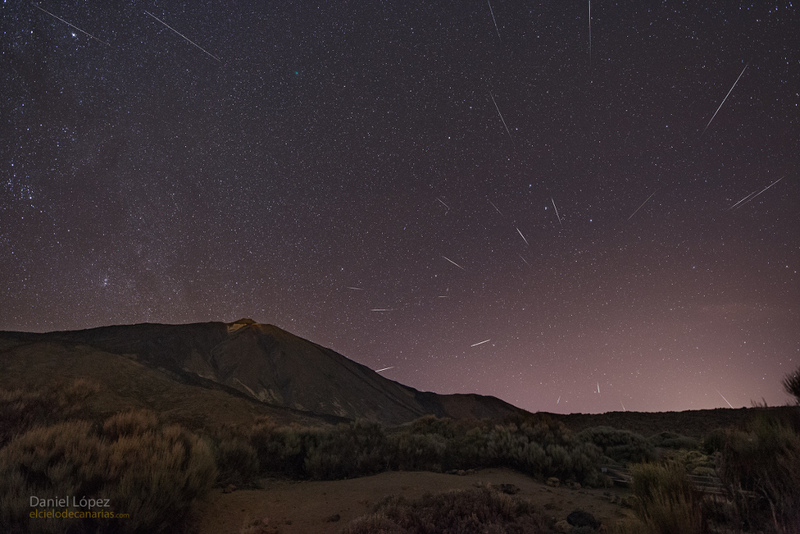 The shower's radiant is rising just to the right of the Canary Island of Tenerife's Teide volcano, and just below the familiar stars of the Big Dipper on the northern sky. A likely source of the dust stream that produces Quadrantid meteors was identified in 2003 as an asteroid. Look carefully and you can also spot a small, telltale greenish coma above the volcanic peak and near the top of the frame. That's the 2018 Christmas visitor to planet Earth's skies, Comet Wirtanen.